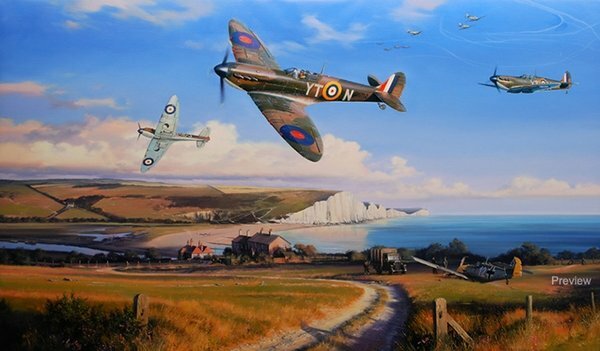 The white cliffs of the south east coast of England, standing defiantly in the face of would-be invaders, are now synonymous with the pivotal conflict in the summer of 1940, the Battle of Britain, the Royal Air Force's finest hour. Spitfire pilots of No.65 Squadron, heading home to re-arm and refuel, display the exuberance of youth as they swoop low in celebration over a downed Bf109. Above them, a squadron of Hurricanes climbs out to intercept raiders above the Channel where the swirling paths of duelling aircraft are traced in vapour, high in the summer sky.